Louis James Piccone was born July 17, 1949 in Vineland. The son of a former professional boxer, Lou was quick, fearless and tough, Lou played much bigger than his wiry 5’8” frame, particularly on the football field. Lou attended Vineland High School, where he played running back, defensive back and returned punts and kicks. Shouts of Lou! Lou! Lou! Filled the air whenever he touched the ball—a tradition that followed him to West Liberty College in West Virginia. Lou played for the Hilltoppers under coach Bob Roe, earning four straight varsity letters. He became one of the nation’s top return men, tearing through traffic with wild abandon. As a junior in 1969, he helped West Liberty earn a berth in the NAIA playoffs. He was the team’s top rusher as a senior in 1970, as the Hilltoppers made the playoffs again. Undrafted in 1971, Lou began his career as a teacher, but continued playing football on the weekends with semipro teams in Youngstown, Ohio and Bridgeport, Connecticut. In 1972, Lou tried out for the Jets. He didn’t make the team, but he impressed Joe Namath with his 4.4 time in the 40 and caught the eye of coach Weeb Ewbank. In 1974, during a preseason players strike, Ewbank sent Matt Snell to Bridgeport to scout Lou and the team quickly signed him. As a rookie in 1974, Lou became the team’s primary kickoff returner. He returned a league-high 39 kicks and was tops in the NFL with 961 return yards. In 1975 and 1976, he also returned punts and saw action at wide receiver. In 1976, during a November game against the expansion Buccaneers, Lou fielded a Dave Green punt on his own 40 yard line and weaved his way through coverage for a 60-yard touchdown. The Jets traded Lou to the Buffalo Bills in 1977 and he became a fan favorite during his six season with the club. He did whatever the club needed, playing primarily on special teams and at wide receiver. In 1979, Lou caught a career-high 33 passes for more 556 yards. He caught touchdown passes from Joe Ferguson in victories over the Colts and Patriots—numbers 6 and 7 in his NFL career. He saw action in two playoff games with the Bills in 1978. 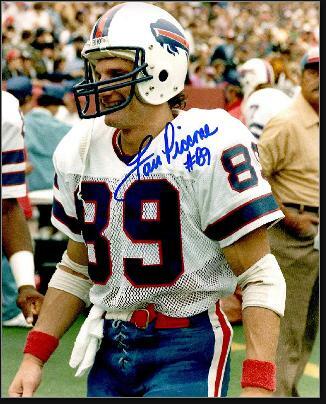 Lou’s tenacity made him an effective player off the field, as he became a players rep for the Bills as well as a member of the NFLPA executive committee. He and Bills legend Tom Day were instrumental in forming the NFL Players Association for Retired Players. After football, Lou put remained in Western New York, where he became a sales and marketing force in the construction and business services industries.